Barabási è un fisico di origine ungherese, nato in Transilvania nella comunità Székely. Questo ne spiega, anche se non ne giustifica, l’acceso nazionalismo: gli ungheresi ritengono, forse a ragione, di essere stati penalizzati nel trattato di Trianon, al termine della 1ª guerra mondiale, a vantaggio della Romania. Il suo nome è legato soprattutto alla teoria delle reti, e in particolare delle scale-free networks, di cui trattava il suo precedente volume destinato al pubblico non specialistico, Linked: The New Science Of Networks (Link. La scienza delle reti). Quando l’ho letto, una decina d’anni fa, nella torrida estate del 2003, ne sono stato fortemente e favorevolmente colpito. Mi era anche capitato, per motivi professionale, di leggere qualche cosa di più tecnico e più accademico di Barabási, che ormai guardavo con ammirazione e rispetto. 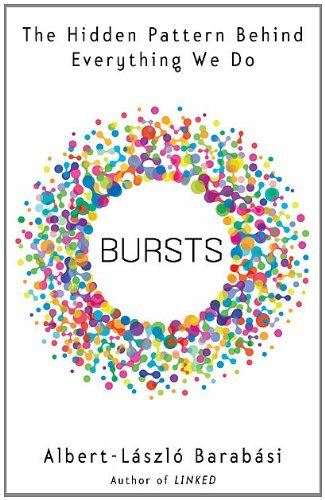 Bursts ha in parte tradito le mie aspettative e vedo, dalle recensioni che si trovano in rete, che non sono il solo. Il problema è che, in questo libro, Barabási divaga in continuazione. Non che questo mi spiaccia: anzi, mi diverte molto e mi ci riconosco anche. Però, in tutto questo divagare, rischia di perdersi il messaggio principale: è questo che – nonostante i molti riferimenti al libro che costellano questo blog (a proposito della trilogia di John Twelve Hawks, ma anche di un suo articolo sulla “rete dei sapori” pubblicato su Nature) – mi aveva finora dissuaso dalla recensione. La tesi centrale di Bursts è che i comportamenti umani siano caratterizzati da bursts, esplosioni di attività all’interno di lunghi periodi di (relativa) quiete (il titolo del libro è tradotto in italiano Lampi, ma mi sembra renda meno di scoppi o esplosioni; allora forse meglio sprazzi). Pensate a come rispondete ai vostri messaggi di posta elettronica: benché i messaggi vi arrivino pressoché di continuo, soprattutto se ne ricevete molti dall’estero e dunque la loro cadenza non è influenzato dai ritmi circadiani del posto in cui vivete, è probabile che tendiate a limitare alcuni momenti della vostra giornata a rispondere. Il perché è molto semplice: le cose da fare sono tante, il tempo è poco. Perciò, istintivamente, date alle cose da fare delle priorità; e quelle che non ricadono tra quelle prioritarie, spesso giacciono inevase: per giorni, per mesi, per sempre. Paradossalmente, proprio perché bursts e priorità sono ineluttabili, prevedere il comportamento umano è più facile, non più difficile. Peccato che questi due importanti messaggi, esposti con chiarezza e rigore, si disperdano in un libro che fa del detour la sua cifra. Tanto per cominciare, oltre metà del libro (14 capitoli su 28, cui vanno aggiunte 15 immagini originali dell’artista transilvano Botond Reszegh: «There is a theorem in publishing that each graph halves a book’s audience. Its corollary for e-books: Each image halves the number of devices that can properly display it.», pos. 4468) è dedicata alla storia di un eroe Székely, Dózsa György alias György Székely che, se non ricordo male, non ha moltissimo a che fare con il suo tema principale. Fino allo spaventoso supplizio del trono incandescente che vedete raffigurato qui sotto. Mr. Barabási worries that burstiness makes us trackable online by corporations and government, particularly as digital tools like mobile phones produce records of our goings and doings. This is genuinely fascinating stuff, and when he focuses on the science, Mr. Barabási is a superbly clear writer. But science constitutes a surprisingly small fraction of “Bursts.” Mr. Barabási spends much of the book delivering real-life stories that are supposed to illustrate his principles. Some, like an account of Albert Einstein’s correspondence in 1919 with a little-known scientist, neatly illustrate how bursts govern our lives. But other stories aren’t so successful— particularly Mr. Barabási’s elaborate account of how a Crusade in 16th-century Hungary turned into a gore-splattered civil war. On its own, the Hungarian conflict makes a riveting story, but Mr. Barabási devotes more than a quarter of the book to its telling—yet never convincingly connects the tale to his theme. It became, for me, a maddening distraction. In the end, Mr. Barabási has written a thought-provoking book. But the most rewarding passages appear only, as it were, in bursts. We live in a data-rich world. Since the publication in 2005 of The Traveler, a New Age “high-tech paranoid-schizophrenic thriller” with an Orwellian twist, a peculiar debate has absorbed cyberspace. The book takes us into a world where life is free of crises and surprises, a world of ennui-inducing normality. This peace and apparent security is maintained by a worldwide system of computers called the Vast Machine, fed by millions of surveillance cameras, sensors, and detectors. Only the members of a once-powerful ancient society and their sword-carrying protectors, the Harlequins, are aware of the Vast Machine’s reach and are willing to stand up to it. The ongoing debate this book continues to inspire on blogs and bulletin boards alike might easily focus on the eerie parallels between our own post-9/11 society and the tightly monitored world described in it. But it does not. It might also center on the book’s literary merits, except that, as one critic put it, the writing “is pitched to perhaps a seventh-grade reading level,” an assessment few would challenge. The debate is instead about John Twelve Hawks, its author. The blockbuster sales and movie rights ought to have elevated Hawks to national celebrity, putting him among the likes of Stephen King and Dan Brown. Yet they did not. And it isn’t because the media shuns him either. The real reason that you never hear about Hawks is that nobody seems to know him. He does not sign books and does not participate in promotional tours. In fact, he has never been seen in public and supposedly communicates even with his editor only through an untraceable satellite phone. Just like the Harlequins on perpetual run from the Vast Machine, John Twelve Hawks lives off the grid, a paranoid seclusion that fuels ongoing speculation regarding his true identity. The book’s central character is a Harlequin who preserves her off-the-grid anonymity by never using credit cards, opening bank accounts, or staying at permanent addresses. Aware that “any habitual action that showed a Harlequin taking a daily, predictable route to some location” will allow the Vast Machine to predict her whereabouts, she “cultivates randomness.” That is, she relies on a random-number generator, or RNG, to guide her decisions. “An odd number might mean Yes, an even number No. Push a button, and the RNG will tell you which door to enter,” freeing her actions from predictable patterns. The book is a tale of a battle between good and evil that takes us briefly into something like that fifth dimension Theodor Kaluza proposed to Einstein, throwing into the mix Japanese sword fights and quantum computing. It also again begs the question, could one build a Vast Machine that foresees our actions? Today each person doing research on human dynamics increasingly faces a similar dilemma: How do we avoid contributing to the creation of a surveillance state or conglomerate, a back-to-the-future ticket to Orwell’s 1984? Hasan has a refreshing answer to this question.